General description and purpose of notice. Our organization’s policy regarding your protected health information (PHI). Uses or disclosures of your protected health information. Treatment. We may use your protected health information to provide you with health care treatment and services. We may disclose your protected health information to doctors, nurses, nursing assistants, medication aides, technicians, medical and nursing students, rehabilitation therapy specialists, or other personnel who are involved in your health care. For example, your physician may order physical therapy services to improve your strength and walking abilities. Our nursing staff will need to talk with the physical therapist so that we can coordinate services and develop a plan of care. We also may disclose your protected health information to people outside of our organization who may be involved in your health care, such as family members, social services, hospice or home health agencies. Any other areas that Elm Terrace Gardens may disclose your PHI for the following purposes: (Birth date, directory or listing, obituary notice, hospitalization notice or posting, prayer list, newsletter, picture, welcome posting, etc). This information may be used in written materials or posted in public areas. Payment. We may use or disclose your protected health information so that we may bill and collect payment from you, an insurance company, or another third party for the health care services you receive at our organization. For example, we may need to give information to your health plan regarding the services you received from our organization so that your health plan will pay us or reimburse you for the services. We also may tell your health plan about a treatment you are going to receive in order to obtain prior approval for the services or to determine whether your health plan will cover the treatment. Health care operations. We may use or disclose your protected health information to perform certain functions within our organization. These uses or disclosures are necessary to operate our organization and to make sure that our Residents/Clients receive quality care. For example, we may use your protected health information to review our treatment and services and to evaluate the performance of our staff in caring for you. We may combine protected health information about many of our Resident/Clients to determine whether certain services are effective or whether additional services should be provided. We may disclose your protected health information to physicians, nurses, nursing assistants, medication aides, rehabilitation therapy specialists, technicians, medical and nursing students, and other personnel for review and learning purposes. We also may combine protected health information with information from other health care providers or facilities to compare how we are doing and see where we can make improvements in the care and services offered to our Resident/Clients. We may remove information that identifies you from this set of protected health information so that others may use the information to study health care and health care delivery without learning the specific identities of our Resident/Clients. Except for limited transactions permitted by the Privacy Rule, a sale of protected health information for which we directly or indirectly receive remuneration or payment . Individuals involved in your care. We may disclose your protected health information to individuals, such as family and friends, who are involved in your care or who help pay for your care. This disclosure may be face to face, by phone or by electronic mail. We also may disclose your protected health information to a person or organization assisting in disaster relief efforts for the purpose of notifying your family or friends involved in your care about your condition, status and location. We may use or disclose your protected health information to courts or administrative agencies charged with the authority to hear and resolve lawsuits or disputes. We may disclose your protected health information pursuant to a court order, a subpoena, a discovery request, or other lawful process issued by a judge or other person involved in the dispute, but only if efforts have been made to (i) notify you of the request for disclosure or (ii) obtain an order protecting your protected health information. Research. We may use or disclose your protected health information for research purposes under certain limited circumstances. Because all research projects are subject to a special approval process, we will not use or disclose your protected health information for research purposes until the particular research project for which your protected health information may be used or disclosed has been approved through this special approval process. However, we may use or disclose your protected health information to individuals preparing to conduct the research project in order to assist them in identifying Resident/Clients with specific health care needs who may qualify to participate in the research project. Any use or disclosure of your protected health information which may be done for the purpose of identifying qualified participants will be conducted onsite at our organization. In most instances, we will ask for your specific permission to use or disclose your protected health information if the researcher will have access to your name, address or other identifying information. Fundraising. We are permitted to use and disclose your protected health information to raise funds from you for our organization. If you do not wish to receive fundraising communications from us, we must provide you with an option to opt-out of receipt of such communications. From time to time we would like to send you information on our work and opportunities for fundraising. 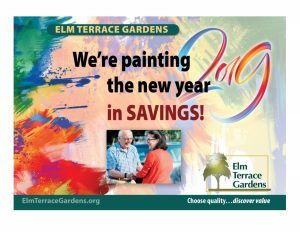 If you would like to opt out of receiving fundraising information from Elm Terrace Gardens, please let us know. Thank you. You have the right to inspect and copy protected health information that may be used to make decisions about your care. Generally, this includes medical and billing records, but does not include psychotherapy notes. To inspect and copy your protected health information, you must submit your request in writing to Kelli Hinkle, Privacy Officer at 660 North Broad Street Lansdale, PA 19446. If you request a copy of the information, we may charge a fee for the costs of copying, mailing, or other supplies associated with your request. If you feel that the protected health information we have about you is incorrect or incomplete, you may ask us to amend the information. You have the right to request an amendment for as long as the information is kept by or for our organization. To request an amendment, your request must be made in writing and submitted to Kelli Hinkle, Privacy Officer at 660 North Broad Street Lansdale, PA 19446. In addition, you must provide us with a reason that supports your request. Right to an accounting of disclosures. You have the right to request an accounting of the disclosures, which we have made of your protected health information. This accounting will not include disclosures of protected health information that we made for purposes of treatment, payment, or health care operations. To request an accounting of disclosures, you must submit your request in writing to Kelli Hinkle, Privacy Officer at 660 North Broad Street Lansdale, PA 19446. Your request must state a time period, which may not be longer than six (6) years prior to the date of your request and may not include dates before April 14, 2003. Your request should indicate in what form you want to receive the accounting (for example, on paper or via electronic means). The first accounting that you request within a twelve (12)-month period will be free. For additional accountings, we may charge you for the costs of providing the accounting. We will notify you of the cost involved, and you may choose to withdraw or modify your request at that time before any costs are incurred. To request restrictions, you must make your request in writing to Kelli Hinkle, Privacy Officer at 660 North Broad Street Lansdale, PA 19446. In your request, you must tell us (a) what information you want to limit; (b) whether you want to limit our use, disclosure or both; and (c) to whom you want the limits to apply (for example, disclosures to a family member). Right to request confidential communications. You have the right to request that we communicate with you about your health care in a certain way or at a certain location. For example, you can ask that we only contact you by mail. To request confidential communications, you must make your request in writing to Kelli Hinkle, Privacy Officer at 660 North Broad Street Lansdale, PA 19446. We will not ask you the reason for your request. We will accommodate all reasonable requests. Your request must specify how or where you wish to be contacted. Right to be Notified of a Breach. If we improperly permit acquisition, access, and use or disclose protected health information about you in a harmful manner, we are required to send, and you have a right to receive a notice from us informing you about the circumstances involved. You may obtain a copy of this notice at our Web site at www.elmterracegardens.org.To obtain a paper copy of this notice, contact Kelli Hinkle, Privacy Officer at 660 North Broad Street Lansdale, PA 19446.